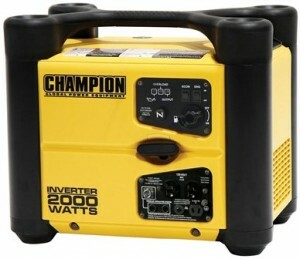 Home Champion Power Equipment What is the Quietest Portable Generator in 2014? What is the Quietest Portable Generator in 2014? 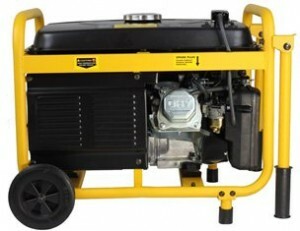 Portable generators are ideal to have around the home especially if you experience frequent power outages. Some generators can run loudly and they can be disruptive. Finding a quiet generator, however, is not that difficult. You can find quiet running generators online and at your local hardware store. Here are a few of the quietest portable generator available on the market. 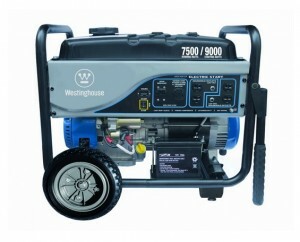 This Westinghouse WH7500E Portable Generator runs on 7,500 watts running and 9,000 watts surge. It has an electrical and manual starting system. It has a quiet operation and a 4 stroke 420cc OHV engine. It has a 6.6 gallon tank and a full enclosure that protects the electrical connection. The engine is protected by its cast iron sleeve and its cast iron fan guard ensures safe operation. It comes with a wheel kit for easy portability, a handle kit, and a tool kit. You also get a funnel and the first amount of oil needed. It comes with various outlets including one 120/240 volt twist lock and four 120 volts. You get a three year limited warranty at time of purchase and it costs about $850 online. It earned 4.5 stars from 50 Amazon reviewers. It can run up to 12 hours on half load and you get 10 inch solid wheels that never go flat. It is non carb compliant and is not sold in the state of California.There is an LCD hour meter and a simplified control center for easy use. This is one of the quietest portable generator with 71 db noise level. It has a low oil shut down to help protect the life of the engine. 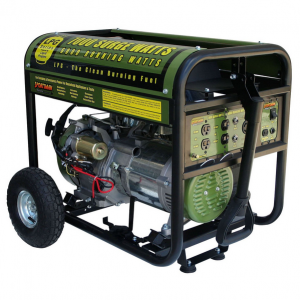 This Sportsman GEN 7000LP Propane Powered Portable Generator is one of the quietest portable generator available to consumers, operating at 80 dba. It has a wheel kit for easy portability and it can run for up to eight hours on 50 percent load. It comes with a one year limited warranty and it is EPA approved. It is non carb compliant and is not sold in the state of California. It has a 13 hp OHV engine and a 12 volt DC outlet for charging the battery. It runs on 6,000 watts rated and 7,000 watts surge. It costs about $849 online and it received 4 stars from Amazon reviewers. It has a five foot propane fuel hose that comes with a regulator and an automatic voltage regulator. It has a few accessories including one 120/240 volt outlet and four 120 volt outlets. It has a low oil shut down capability to prevent damage to the engine. 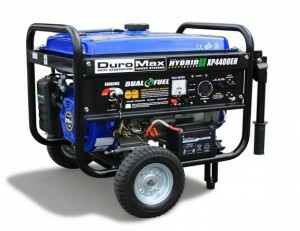 This Duro Max XP4400 EH Dual Fuel Propane Gas Powered Portable Electric Start Generator runs at 4,400 watts surge and 3,500 watts rated. It weighs about 130 pounds and it comes with various outlets including one 120 volt three prong 20 amp outlet and one 120/240 volt twist lock 30 amp outlet. It has a low oil shut down to help prevent damage to the engine. It has an air cooled 7 hp engine for added power. There is a volt meter and an engine shut off switch on the full power panel. This item costs about $650 online and it received 4.5 stars from Amazon reviewers. This machine runs quietly at 69 db, making this one of the quietest portable generator online. It has a fuel gauge to easily monitor the amount of fuel available and it can run at idle to hold the rpm at a continuous level, saving on fuel and keeping the noise level down. It has a fuel capacity of four gallons. This Champion Power Equipment 7356i Gas Powered Portable Inverter Generator is carb compliant and is sold in all 50 states. It costs about $570 online and it earned 4.5 stars from more than 40 Amazon reviewers. It has an 80 cc OHV four stroke engine. It runs up to 9 hours at 25 percent load and it has a fully enclosed housing. It weighs about 48 pounds and comes with a two year limited warranty. It has a low oil sensor to help protect the life of the engine. It has an easy carry handle that is built in for easy maneuverability and it comes with an overload protection. There are several outlets it comes with including one 120 volt duplex, a spark plug socket, and one 120 volt DC outlet. A 12 volt dc charging cable is included as well. 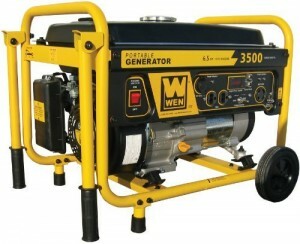 This Wen Gas Powered Portable Generator 56352 comes with a wheel kit for easy portability. It has a 7 hp 212cc engine and comes with a two year limited warranty. It runs on 3,000 watts rated and 3,500 watts surge. It has a muffler with a spark arrestor that helps reduce noise. It comes with various outlets including two 120 volt three prong 20 amp receptacles, one 120/240 twist lock 30 amp, and one cigarette lighter 12 volt dc outlet. It can run up to 11 hours on 50 percent load.It has a four gallon fuel tank and a fuel gauge that allows you to determine when it needs more fuel. It has a low oil shut down and an hour meter. Its noise level is 67 db, making this one of the quietest portable generator online. It is non carb compliant and is not sold in the state of California. These are all among the quietest portable generators available on the market. They have multiple features and capabilities that makes these generators great choices to have in your home and at outside events. Determine which one works best for you by analyzing the benefits that each one offers.